Hello from Miami !!! I arrived yesterday evening and it’s my first time here, I hope to bring back a ton of photos to you and also maybe to get a little tan ! For today, a picture not taken in Miami, but in extra sunny London on a day of great big sun. All right ! Going to put on my Hawaiian shirt and jump on my bike. See you later ! Kisses ! have a great time! miami is definitely very fun and different. always jet setting!!! On a hâte de découvrir tout cela ! Et très belle photo au passage ! Poppy est tellement fraîche et joyeuse avec son style ! C’est une vrai source d’inspiration ! Repose toi bien à Miami! J’adore cette ville avec son architecture très kitch. Have a wonderful time and that picture is perfect, love the glasses. trop de chance, je rêve de soleil, plage et sable chaud ! ramène nous des belles photos ! Amuse toi bien Garaaaance! Plein de photos stp! Welcome to Miami! Hope you enjoy our little city…If you are looking for any particular recommendations let me know! @bymelic Bisou! J’adore cette mode de lunette de soleil super urbaine/sophistiqué! Enjoy your weekend! I hope that you enjoy the beautiful weather! Love Poppy- fab glasses and overall styling. Have a great time in Miami! I’m pea green with envy as I sit here looking out at a 10th straight day of heavy rain. Miami is a wonderful, fun place. Enjoy! Ah trop jalouse! Profite de Miami c’est trop chouette! Bienevenido a Miami! I hope you enjoy that elusive Mr Sun who seems to gave joined you on holiday as London is rather over cast today.. Anyway, I’m in Venice (not Beach…!) right now and the sun is shining like never before! I love it!! Pas de commentaire sur cette jeune femme et ce portrait réjouissant (à l’instant où j’écris ces lignes)? Dommage, car je trouve que l’on ne peut que “complimenter” ce look réellement cool et fun! Welcome! Just be patient with the sun.. it will be out later:) Enjoy your stay ..Looking forward for your photos and comments pos-Miami stay. va au WEBSTER voir la boutique, c’est celle de Milan Vukmirovic et faire du shopping: 1220 collins av. Have a wonderful time! Bon Voyage! Love this period of the year when we are all so excited about the coming spring! Miami Baby ! Enjoy the sun !! Bon séjour à Miami, Garance! J’adore la couleur de cheveux et les lunettes! Ah, les lunettes!!! She’s so cute! Love these sunnies! Gorgeous photo–love those sunnies. Hope you have a great time in Miami. Now, after I’ve watched your videos, every time I read a post from you, I hear your voice in my head. Somehow, you bring a lot of positive energy and a light feeling. Just reading from you is already a very positive experience. You can make everyone’s day! I hope you enjoy the sun of Miami! Ces lunettes sont à tomber! Et le reste du look de cette jeune femme aussi! Profite bien de ce repose mérité à Miami Beach! Although living in NYC for 11 years, I am from Miami. Cruise my old hood-the Art District….lay and soak the rays at The Standard..go have dinner at The Dutch and for some local hangout…have drinks at Elad. Enjoy! I love Miami, so many good restaurants. Give Prime One Twelve a try, or any of the Myles Restaurant Group places. Trop chouette! On a hâte de découvrir les photos! Superbe! Looking forward to seeing your photos of beautiful Miami. And the photo inspires me to get some sun as well. Hâte de découvrir tes photos. garance, please go to Mandolin restaurant. You will fall in love with this gem….truly magical. have a great time in Miami!! Have a great time… and give us some tips on Miami afterwards, please! I love when you talk about nice hotels, restaurants, etc. Love that sunglasses, by the way! Have a great time. Send us pictures of warm weather fun in the sun outfits!! I have these glasses… I wore them on my blog the other day… love miu miu – also gorgeous in red !!! I want those Mui Mui sunglasses…they r always sold out…she wears them well..
Je pense que t’a déjà merité un beau soleil de Miami. J’ai écrit quelques chose sur ta réussite dans mon blog. Je vous félicite les deux aussi, encore une fois, toi et Scott Schuman! C’est grande! Ouhlala, mais quelle chance! Ca envoie de l’été! Pi d’abord, a Paris aussi, il faut chaud (12 degrés, canicule quoi). Ces lunettes sont démentes, des Miu Miu ou je me trompe? Et puis les petits poils rouges… Je vais m’en faire pousser, ça va être vite vu. Haaaa!!! Miami Beach ! ça fait 1 bail que j’y ai pas mis les pieds !Poste-nous 1 photo de Miami Beach girls please ^^ tellement différend de L.A. ou New York ! Swimsuits ou Shades en Florida style ! Il a fait 22° aujourd’hui à Paris, et c’est mardi le printemps ! Garance welcome to Miami!!! If you need any tips I have many fashion secrets worth sharing. This picture makes me so happy!!! je suis à Miami aussi en ce moment! Si tu as des bon plans de restos ou autres je suis prenante mais en tout cas je te suggère d’aller au Casatua (Resto italien divin). I am Soooooooo excited to see your Miami photos! Garance , trop cool tes photos j adore â chaque fois que je viens le lire. You should go to Red White and Blue thrift store in North Miami. You will love it! Fabulous sunny pic. It makes me feel warm, and put a smile on my face!! Have fun in Londres and take lots of pics.. Welcome to MIA! Hope you enjoy our city! Congratulations to you and Scott on the CFDA much deserved recognition. Love, love, love your blog! omg youre in miami, im in new york will be arriving on tuesday just in time for the fashion week there. are you doing anything special? Enjoy Miami!! The sun is still picking in here!! bon ok j’ai loupé un épisode mais je voulais moi aussi vous féliciter pour le prix remporté. je ne sais absolument pas ce qu’est le CFDA (une belle occasion d’approfondir mes connaissances :)) mais le simple fait de savoir que Bruce Weber l’a aussi reçu me laisse à penser que c’est TOP ! bravo à vous deux de tout coeur ! Welcome to Miami Garance! Just in time for the March Madness – enjoy! Fun glasses – she looks like a cross between Gwyneth Paltrow & Chloe Sevigny! Miami!!! j’espere que tu vas bien t’amuser là bas! This photo just makes me happy!! Amazing photo! 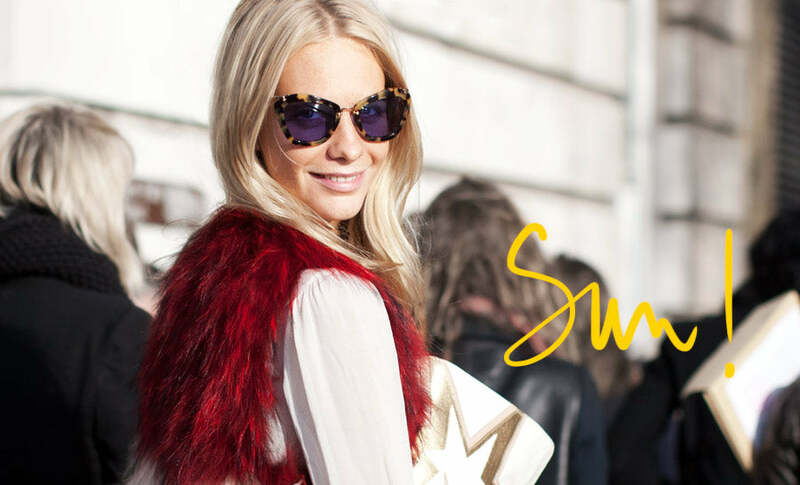 Trying to catch the street fashion of stylish women in London on my blog….. http://www.stylefig.com…..Sunshine, here we come! This photo just makes me happy!! Amazing photo! Trying to catch the street fashion of stylish women in London on my blog….. http://www.stylefig.com …..Sunshine, here we come! Miami le rêve !!! Ces lunettes sont sensas’ d’ailleurs !!!! so lovely. i adore those sunglasses! a great photo. Oh, the sun!…I love it!…We´re waiting for more…Enjoy it! LUCKY YOU ! Enjoy it as much as you can ! Poppy has such an amazing style!